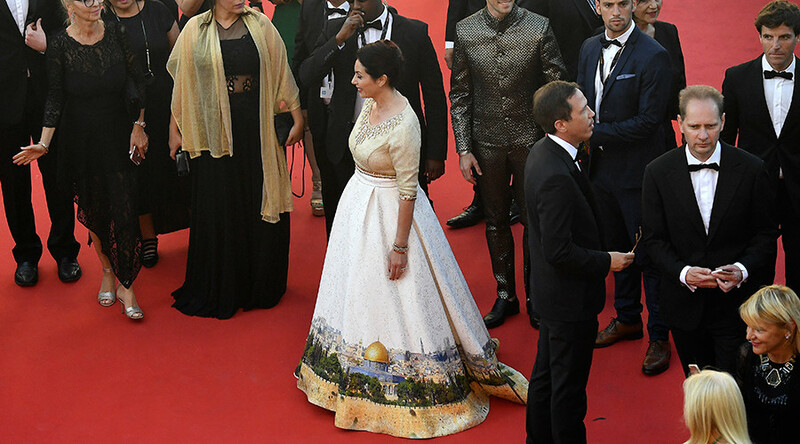 Israel's culture and sports minister chose a rather unique ensemble for her appearance at the Cannes Film Festival, wearing a dress which featured the Old City of Jerusalem. Unsurprisingly, the internet quickly fired out its own variations of the dress. Miri Regev was dressed rather elegantly for the posh affair, wearing a dress which featured a sparkly neckline, and with her hair styled. In fact, at first glance nothing about her ensemble seemed out of the ordinary – from the knees up, at least. However, the bottom of Regev's dress was a different story. It featured the skyline of the Old City of Jerusalem, in a move designed to honor the "50th anniversary of its liberation and unification," according to her press release, as cited by Haaretz. Many on the internet were quick to remind Regev that most of the international community regards east Jerusalem as being under Israeli occupation – despite the country claiming sovereignty over the entire city. The internet provided an array of alternative dresses for Regev, including one of a blood-soaked bottom half, with the message "thanks for the canvas and kindly f**k off." Another appeared to show an Israeli warplane conducting an airstrike. Miri Regev, #Israel Minister of Culture...of HATE! One version showed the West Bank separation barrier snaking around the minister's dress. Another showed a fiery blaze emerging from the city, an apparent reference to the violence that routinely takes place in the region. A similar version showed clouds of smoke billowing up from Jerusalem. One simply placed a local diner on the dress – because diners are the great equalizer, right? Shoshke Engelmayer, the fictional alter ego of Zeev Engelmayer, a famous Israeli cartoonist, also got involved, photoshopping himself wearing a similar dress which featured a scene of Tel Aviv. And yet another tweet chose to take a slightly different approach, turning the picture on Regev's dress into a hairdo and long sideburns for Israeli Prime Minister Benjamin Netanyahu. As for Regev, the patriotic minister has shrugged off the criticism. “Jerusalem is not a provocation, and it was lovely to see how much affection the dress received at Cannes,” she told Ynet.